As promised, here's a follow-up post for my latest class assignment of capturing motion. Rather than exaggerating motion as in the last one, this is more a freeze of motion. I've seen this done before by other photographers in a few different ways, but I wanted to do some experimenting with it on my own. Plus, after my practice with the 3 apples a couple weeks ago, I was a little more confident this time with my little makeshift studio. 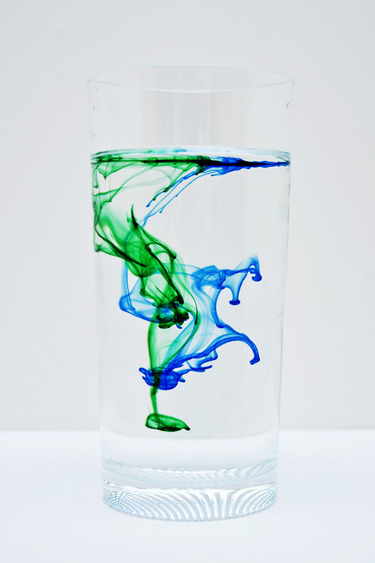 I thought that food coloring would be a highly visual way to show movement...the way it dances its way through the flow of the water in a clear glass is very intriguing. The forms of color look unique every time you squeeze a drop in. I played with the temperature of the water as well as the direction of motion (or lack of motion) inside the glass for each trial. Turns out I liked the way the food coloring wound its way through the warm water best -- in the colder water, it didn't disperse as much (hot water was the opposite extreme). And it was most fun with multiple colors, however it was more difficult to drop them strategically to make interesting forms by themselves before they began to intertwine and twist together. I'm pretty happy with how these turned out though.